As a wakeboarder, you instantly have something in common with fellow riders. Displaying to others that you are into the wake scene is a good way to meet new people to ride with, find others to talk to about wakeboarding or just give you something interesting to talk about. One good way to show off your passion is with stickers and decals. 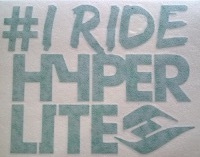 We have a large selection of wakeboard and wakeskate decals and stickers. We even have a good amount of Surf stickers and decals.